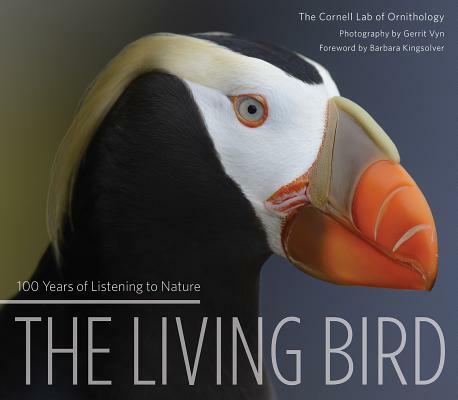 Living Bird: 100 Years of Listening to Nature (Hardcover) | Eagle Harbor Book Co. The superlative pictures alone make this book a must-have for any serious admirer of avian life. But dig into the inspiring essays, and you’ll be hooked. I loved the delicious bits from Barbara Kingsolver, who came reluctantly to a love of birds, and from John Fitzpatrick, executive director of the Cornell Lab of Ornithology, on how birds can save the world. For 100 years, the Cornell Lab of Ornithology has researched the lives of birds, educating the public and striving for protection of species and habitat. But the Lab does more than just study--it celebrates birds through song and image, and connects people to birds, opening thousands of eyes to the natural world around us. An intimate yet stunning exploration of North American species, The Living Bird shares our joyful and complex relationship with birds. Through imagery and thoughtful essays, award-winning photographer Gerrit Vyn, along with leading naturalists and bird enthusiasts, takes readers on a visual and experiential journey, revealing the essence of the century-long work done by the Cornell Lab of Ornithology. Barbara Kingsolver remembers herself as a reluctant birder until, years later, she exalts in a special birding trip with her father. From this evocative beginning, Scott Weidensaul then delves into the secret lives of birds: How do flocks of birds manage to migrate thousands of miles? What determines who mates with whom? And what is the purpose of all those pretty feathers and glorious melodies? In her essay, Lyanda Lynn Haupt finds inspiration in our everyday birds as they connect us to the natural world, and she describes how citizen science--sharing daily observations via ebird, for example--has enriched her own understanding of everything around us. Director of the Cornell Lab of Ornithology John W. Fitzpatrick considers the threats birds face today, and some of the failures--and successes--of the past. While too many species have been driven to extinction, others have made remarkable recoveries thanks to human action. Jared Diamond underscores that it is in our hands to preserve the living birds around us. Throughout, Vyn's remarkable photographs of birds, both familiar and exotic, bring the exhilaration of migratory Whooping Cranes, the fragility of the endangered Spoon-Billed Sandpiper, and the wide-eyed beauty of Great Horned Owls alive on the page. From enjoying Black-capped Chickadees or Yellow Warblers in a backyard birdbath to spotting a Pileated Woodpecker in the woods to admiring the powerful soar of a Gyrfalcon, the appeal of watching and listening to birds leads us into a greater understanding of their environment--and of ours.